If you are of a certain age you will remember chain letters. They are the old fashioned version of email forwards. If you don’t send this to 10 friends true love won’t find you, your wish won’t come true, or something bad will happen to you. Amish friendship bread is the culinary version of a chain letter. If you don’t bake your friendship bread your friendship with the person who gave you the starter is doomed –ok maybe I am exaggerating a little. I don’t think the Amish are that cruel. Actually according to trusty wikipedia Amish friendship bread may not actually have any connection to the Amish people –Shocking! My sister-in-law is an Amish friendship bread baking master. I am not sure of the actual number of loaves and muffins she has baked, but I would venture to guess over a dozen. She baked a couple of the traditional cinnamon sugar loaves for a family brunch we had last month. That was the first time I had the bread since middle school/high school when my friend had made it and shared her starter with me. With my starter I wanted to make something different than the traditional cinnamon and sugar friendship bread. 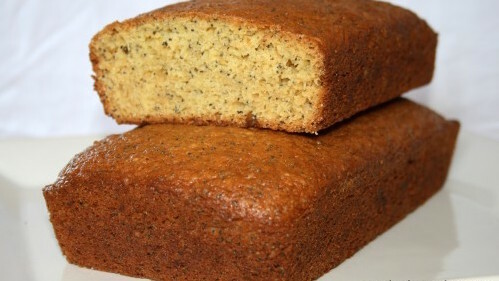 The combination of lemon and poppy seeds evoke feelings of happiness for me. I knew if I could pull off a lemon poppy seed friendship bread it would be the perfect way to celebrate Spring. In a small bowl, dissolve the yeast in warm water for about 10 minutes. Stir well. In a 2 quart glass or plastic container, combine 1 cup sifted flour and 1 cup sugar. Mix thoroughly or the flour will get lumpy when you add the milk. Slowly stir in warm milk and dissolved yeast mixture. Loosely cover the mixture with a lid or plastic wrap. The mixture will get bubbly. Consider this Day 1 of the cycle, or the day you receive the starter. Day 5 - Add 1 cup each flour, sugar and milk. Day 10 - Add 1 cup flour, 1 cup sugar and 1 cup milk. Divide into 4 containers, with 1 cup each for three of your friends and 1 cup for your own loaves. Give friends the instructions for Day 1 through Day 10 and the following recipe for baking the bread. Make a well in the center of the bowl. In another bowl mix together all the wet ingredients. Pour wet ingredients into the dry ingredients, mix until just combined. Pour mix into two greased loaf pans. Bake for 1 hour. Cool in pans for 10 minutes before removing bread from pan and transferring to wire rack to cool completely. ENJOY! oh that looks great! by the way – I linked to your blog today after following your recipe for dinner rolls! They were a complete success -thank you!